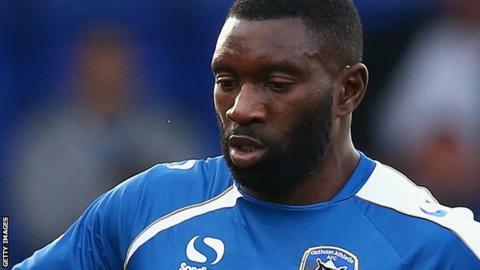 Striker Jabo Ibehre can be a useful goalscoring option for Carlisle United, says manager Keith Curle. Ibehre, 32, had scored just 83 goals in 461 league games with eight clubs before his summer move to Brunton Park. However, the former Leyton Orient, Walsall, MK Dons, Colchester and Barnsley forward has already netted three goals in two games for Carlisle. "People said to me 'He won't score enough goals'. I think he will," Curle told BBC Radio Cumbria. "I like Jabo, his personality, his demeanour, willingness to help others and his understanding of his role within the team." Ibehre's double against League One side Chesterfield at home in the 3-1 League Cup win on Tuesday capped a pleasing team display. The Cumbrians struggled to safety at the end of the last campaign, lifting the club nine points clear of danger after a late-season flurry. Curle's overhaul this summer has brought about a bright start, with two wins from two games in league and cup. "I've enjoyed being around the group," he added. "When we show the rewards the easier it is to get people involved."